They spent two of their Thanksgiving Days at the presidential retreat in the Catoctin Mountains of Maryland, Camp David, one at their private home La Casa Pacifica, in San Clemente, California, and two in the White House, but during the Nixon presidency, the President and Mrs. Nixon celebrated the holiday in ways that both reflected how it was marked by millions of other American families and yet offered an innovative example of how it could be more compassion shared. Pat Nixon instituted more public outreach in connection to Thanksgiving than did any other First Lady. She shared new variations on traditional holiday recipes, assumed the presidential role in the annual ceremony of accepting gifts of turkeys and even issued the first and only Thanksgiving Day proclamation ever issued by a First Lady. Most remarkably, she invited “the people” to share the holiday with the presidential family in the historic rooms of the “people’s house,” as she frequently referred to the White House. For many generations, citizens had annually besieged First Ladies during the holiday season with requests for recipes she and her family enjoyed; in a sense, it was a method that offered a sense of commonality between citizens and their leader. Always conscientious of how important it was to respect every incoming letter with a personal response, Pat Nixon had cards printed with recipes of food courses she and her family enjoyed. She had long recognized that food also served as a humanizing factor in politics; during the 1968 presidential primary campaign, for example, she had one of her favorite recipes reprinted on a paper flyer hung on the front doorknobs of houses where doorbell-ringing campaign staffers found nobody at home. With the onset of the holiday season, however, the First Lady saved the time of those who might write her for recipes and that of her correspondence staff, (as well as the cost of printing recipe cards) and instead issued press releases to the nation’s newspapers with the ingredients and cooking instructions of some Nixon family served at Thanksgiving. Among these were Mrs. Nixon’s recipes for corn soufflé, almond green beans, and chestnut stuffing. The last of these called not only for chestnuts but included bacon, raisins, apples, and chopped celery as ingredients. It was released in 1969 to the press to coordinate with the National Turkey Federation’s annual presentation of its traditional gift of a bird to the President. She also preferred a variation on the familiar, mashed potatoes. Perhaps a reflection of her Irish father’s tastes, she had this side dish blended with mashed yellow turnips, a recipe from Ireland known as Colcannon. Haller also recalled that this First Lady liked roast turkey all year round, requesting it frequently be served to the presidential family. During the third Thanksgiving holiday of the Nixon administration, it was the First Lady and not the President who presided over the customary ceremony to accept two live turkeys from the National Turkey Federation. The event, taking place in the Rose Garden on November 23, 1971, reflected a fundamental change in the American household. With families increasingly pressed on time and facing rising food costs, many opted to purchase the less expensive and perishable frozen turkeys, rather than fresh ones. 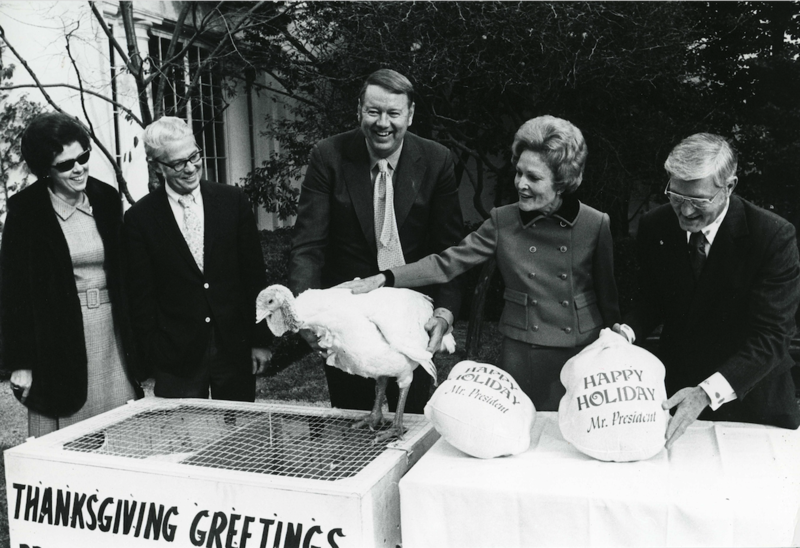 Thus, Mrs. Nixon permitted the Poultry and Egg Board to attend the ceremony and present two frozen turkeys. The White House did not explain why it was that the First Lady broke precedent to accept the birds, rather than her husband. Some speculated that it was due to his being scheduled at the same time to visit the Washington Redskins football team’s practice facility; a fanatical football fan, Nixon strongly rooted for his adopted city’s home team. The President and his wife would spend Thanksgiving 1971 in peaceful privacy, at their San Clemente, California estate “La Casa Pacifica.” Being on the Pacific coast, however, did not mean the President was not up early. Before seven in the morning, he was on the phone with the nation’s two leading Republican governors, Ronald Reagan of California and Nelson Rockefeller of New York, several Cabinet members, and House and Senate leaders. This third Thanksgiving of the presidency, Julie Nixon remained on the East Coast, celebrating the holiday with her husband David and his parents, former President Eisenhower’s son and daughter-in-law John and Barbara Eisenhower, at their home just outside of Philadelphia. Joining them was the First Daughter’s grandmother-in-law Mamie Eisenhower. In New York City, the other presidential daughter, newlywed Tricia Nixon Cox, was with her husband Edward Cox and his parents; the couple had wed in a White House Rose Garden ceremony just five months earlier. While his daughters were beginning their Thanksgiving dinners, the President was taking a rare rest from work, simultaneously watching two football games on two televisions sets — one playing the Nebraska-Oklahoma game, the other between the Dallas Cowboys and the Los Angeles Rams. As the sun set on the West Coast, and a cool fog grew into the lush gardens of La Casa Pacifica, Richard Nixon and his wife sat down for a simple holiday meal that mirrored the menus served in most homes: roast turkey, sweet potatoes with marshmallows, green beans amandine and pumpkin pie. The couple was not alone. Although “Ted and Judy,” the Vice President and Mrs. Spiro Agnew, were in California for the holiday as well, they spent it with friend Frank Sinatra and his family at their desert home in Palm Springs. The Nixons shared their meal with the President’s longtime personal secretary Rose Mary Woods, a loyal friend to their whole family, and Dr. Walter Tkach, the presidential physician. 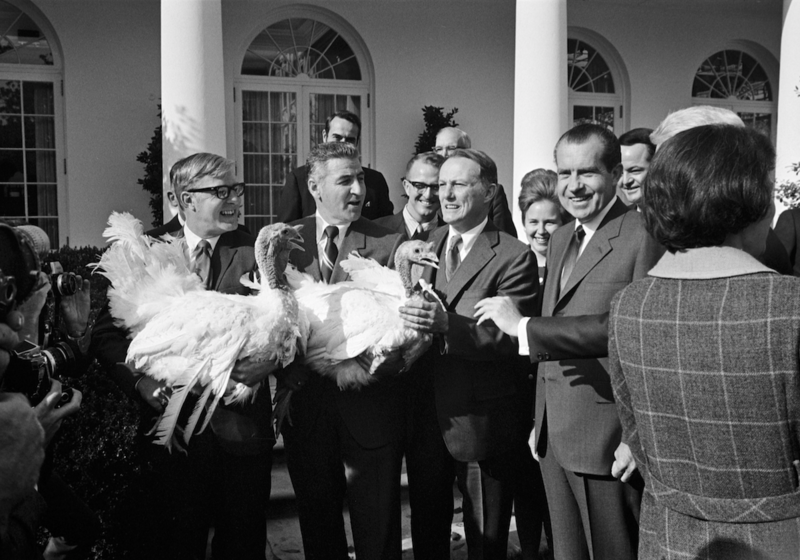 In 1972, the Nixons celebrated Thanksgiving in quiet peace the following year of 1972. Coming just three weeks after the President’s re-election victory, months of campaigning across the country had left the family exhausted and they welcomed the woodsy comfort of the presidential retreat Camp David. Navy stewards from the White House mess prepared the family’s meal of roast turkey, bread dressing, giblet gravy, Colcannon, green peas and onions, fresh cranberry salad mold, minted pears, hot dinner rolls and pumpkin pie with whipped cream. 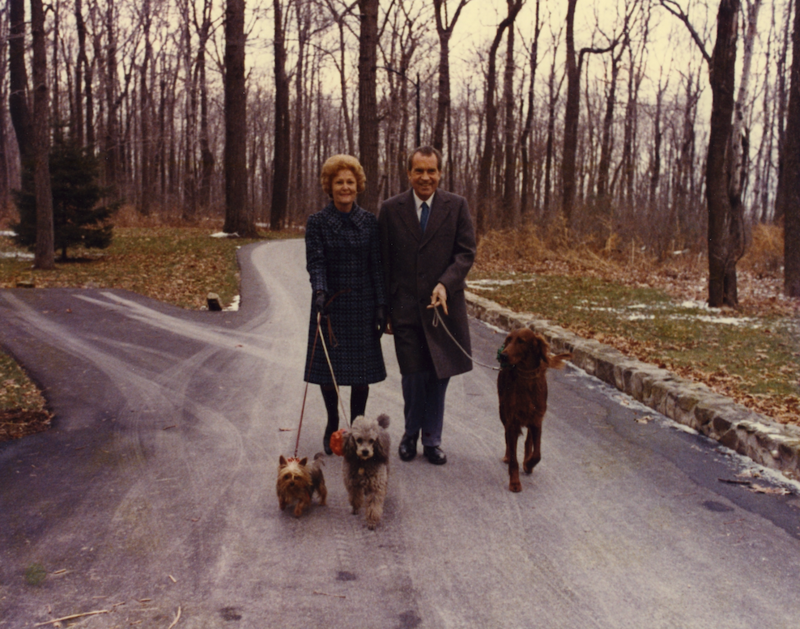 President Nixon had left for Camp David a full ten days before the holiday, seeking the solitude to focus on new personnel and the domestic and foreign policy agendas of his second term. Presidents are rarely permitted the chance to indulge in lengthy relaxation, and after sharing his holiday meal, President Nixon abruptly returned to the White House. That night, while most Americans were enjoying their families and friends, eating leftovers, watching television or napping, President Nixon conducted West Wing meetings with his Secretary of Transportation and Secretary of Housing and Urban Development about the governmental reorganization. The last Thanksgiving of the Nixon presidency, 1973, was again celebrated at Camp David by the President and Mrs. Nixon, shared with daughter Tricia, son-in-law Edward Cox and longtime family confidante Bebe Rebozo. It coincided with serious challenges facing the President. The day before Thanksgiving, the White House informed the nation that presidential secretary Rose Mary Woods had accidentally erased a portion of his conversations taped for the historical record, and a district court had requested surrender of all the tapes, which had been subpoenaed. Even on Thanksgiving morning, the President was working, conducting morning meetings with Secretary of State Henry Kissinger in a “general review of foreign policy,” his chief of staff Alexander M. Haig Jr., and press secretary, Ronald L. Ziegler. The most troubling decision Nixon had to face on Thanksgiving 1973 was determining how he would ask the American people to help cope with an expected fuel shortage as winter approached, including a possible ban on Sunday gasoline sales. That very day, as a result of the energy crisis, the White House literally darkened. To set an example for citizens to limit their use of electricity during the upcoming holiday season, the President announced that, from Thanksgiving Day until New Year’s Day, the night floodlighting of the White House would end. It must have been especially sad for the First Lady, three years earlier, to the day, she joined the President to first turn on the lights, the result of her efforts with engineers to make the historic “people’s house” visible at all hours of the dark. There was another Thanksgiving footnote for Pat Nixon in 1973. With the President focused on the challenges pressing in on him, it was the First Lady who again, for a second time, substituted for him in the ceremony to accepting the gift of a turkey. It was her first two Thanksgivings that Pat Nixon presided over as First Lady, in 1969 and 1970, however, that most directly reflected her value of compassion and promise to share the “people’s house” with the people. 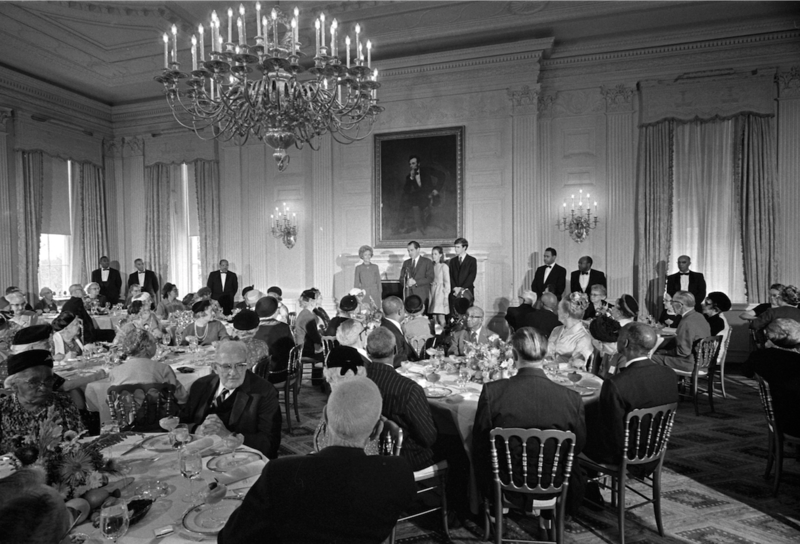 In 1964, a Washington, D.C. nonprofit organization formed with the mission of reaching neglected and isolated communities in the city, began a tradition of “The Thanksgiving Day Salute to Senior Citizens.” Learning of this shortly after she became First Lady, Pat Nixon saw the event aligned well with her promise to make the White House more publicly accessible, and encourage voluntarism by raising public awareness of successful volunteer projects. She offered to host her family’s 1969 Thanksgiving dinner in the White House for local senior citizens who had no families with which to share the day. The invitation was accepted. On Thursday, November 27, 1969, 225 guests, coming from 18 regional retirements and assisted living facilities, arrived for Thanksgiving dinner at the White House as guests of the Nixons. The President and First Lady, their daughters Julie and Tricia, son-in-law David Eisenhower, his sister Susan, their grandmother Mamie Eisenhower and the former First Lady’s elderly uncle Joel Carlson sat among the guest tables in both the East Room and State Dining Room. The President had some repartee with 93-year old John Graves, the eldest guest there, recalling how his maternal grandmother Elvira Milhous, who lived to the same age, spent each Sunday volunteering at a home for retired soldiers. The President didn’t join in the actual meal itself, however, later eating instead of a lighter lunch of his favorite cottage cheese in the family’s private dining room. 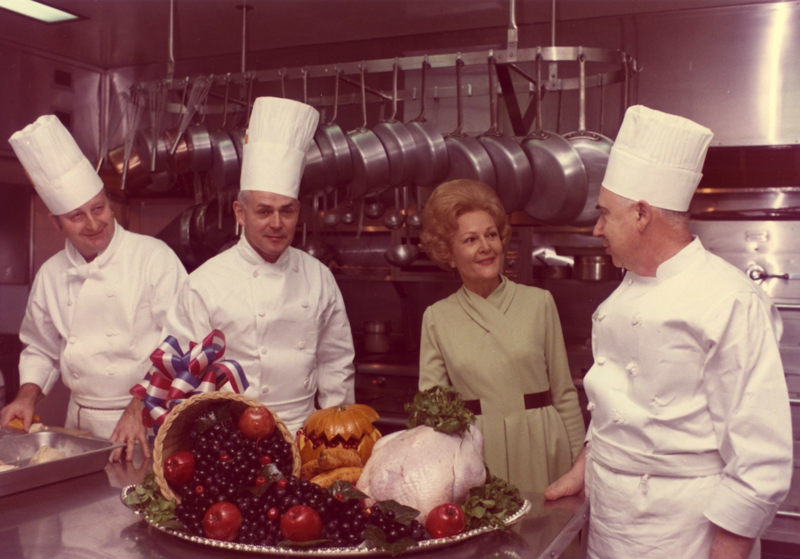 The following year, Pat Nixon continued her new custom, hosting a Thanksgiving Day dinner on November 26, 1970, for another neglected demographic: wounded and disabled veterans. 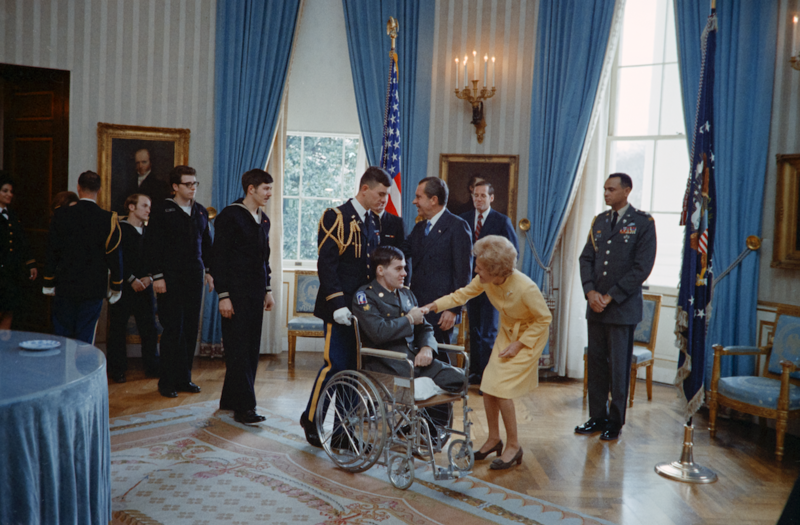 From three area hospitals, 98 servicemen and the nurses who helped push their wheelchairs and carry their stretchers were received in the Blue Room by the President and Mrs. Nixon and were then dispersed at dinner tables for a noontime meal. Former First Lady Mamie Eisenhower again attended, along with First Daughter Tricia, who then lived with her parents in the White House. They, along with Richard and Pat Nixon, sat among the guests. To the wounded and disabled men, the First Lady asserted her belief that the White House is “your home.” In recalling his own navy service during World War II, the President spoke of how being away from a warm home during the holiday season was “the hardest thing of all” during military service.